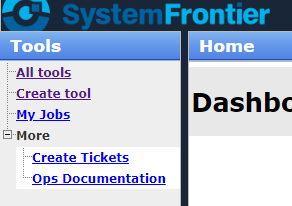 The latest release of System Frontier adds some exciting new features. See more details in the changelog. The first one may seem small, but can be a big impact on keeping things that are important to you and your team in focus: custom menu items. A new permission, WriteCustomNavigation, gives you the ability to add new items to the main navigation pane and assign which role(s) can see them. You can also make them private, for things only you may want to link to. Any custom menu items you add or have access to will show up under the “More” node in one of the main menu sections. In large organizations where admins and operators are using SF on a daily basis, having links to useful information and other tools can save a few clicks. Less clicks means more productivity and faster TTR (time to resolution). Log into your account now to download the update or sign up for a free 30 day trial to check it and many other features out. This entry was posted in PowerShell, Releases. Bookmark the permalink.